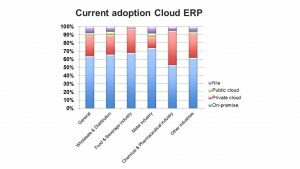 The emergence of Cloud ERP solutions is likely to change the ERP software market significantly. In order to assess the scale of these changes a comprehensive study of the ERP software market has been done recently. The report which can be downloaded on the bottom of this page summarizes the responses of almost 200 CEO’s, CFO’s and CIO’s and related decision makers. It also includes comprehensive desk research and almost 30 interviews at ERP customers, ERP consulting companies, ERP suppliers and ERP implementation partners. Let’s kick off with some quotes to give insight into these ‘market changes’. These quotes, gathered from the study on the ERP market, indicate the uncertainty, risks and opportunities ERP suppliers, customers and other stakeholders are dealing with at the moment. This comprehensive study has revealed a glimpse of something that’s still a grey area for many companies: “The impact of Cloud computing on the ERP software market”. We seem to be in a huge transition from on-premise to Cloud. For quite a while now, Oracle, SAP and Microsoft have been calling themselves market leaders. Mergers and acquisitions in the ERP world occurred regularly the last decades but these ERP suppliers remained. However, continuing technological advancements lead to new opportunities for both traditional ERP suppliers and new market entrants. Cloud is catalyzing major shifts in the IT landscape causing opportunities and treats for all the different stakeholders. 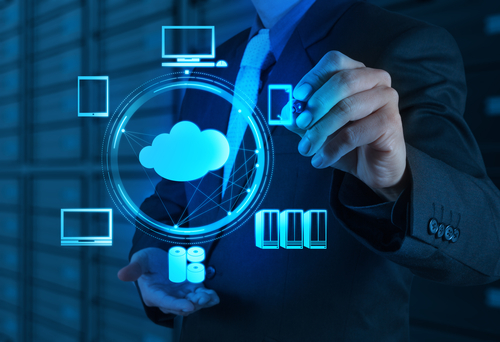 Almost all traditional suppliers focus, to a greater or lesser extent, on Cloud applications. They offer existing software or totally new software as private Cloud ERP or public Cloud ERP. Originally on-premise solutions like Oracle JD Edwards, Microsoft Axapta and SAP are available in a private Cloud. Oracle ERP Cloud, SAP S/4 HANA and Microsoft Dynamics NAV Cloud are just a few examples of public Cloud offerings. Additionally, there are “born in the Cloud” suppliers like NetSuite and Plex. From this, we can conclude that the emergence of Cloud ERP has already changed the ERP software market and will continue to change it. None of the market actors can overlook the fact that the rise of Cloud has huge consequences. They are forced to support this technological trend and to be aware of the interplay between their competitors offering Cloud products and the market asking for Cloud products. Are we in a transition from on-premise to Cloud? According to the survey research that has been conducted in the Netherlands within Wholesale & Manufacturing, the current adoption of private Cloud ERP is high and the current adoption of public Cloud ERP is still relatively low. Although there’s a slight difference between the different sectors the discrepancy is obvious. 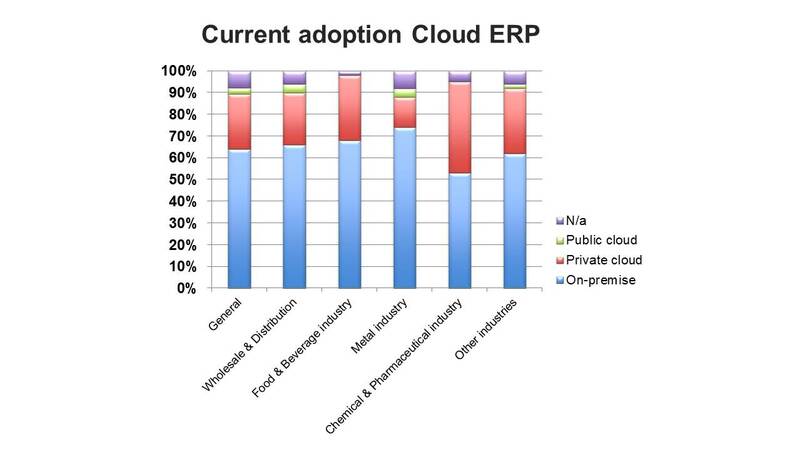 For many years now, there’s been a high adoption rate of private Cloud ERP and this trend seems to be continuing. Companies using ERP consider private Cloud as an option which has the advantages of outsourcing, but fewer disadvantages and risks than public Cloud. Both the interview outcomes and the survey research provide the same conclusion. The adoption of public Cloud non-ERP applications like CRM, HRM and BI is very high as these applications are considered as less complex and less risky to bring to the Cloud. The adoption of public Cloud ERP is particularly high at small companies with relatively simple business processes. One question that arises, however, is why the adoption of public Cloud ERP lags behind at mid-size and large companies in Manufacturing and Wholesale & Distribution? What exactly are the disadvantages and risks that are being perceived by the industry and are these concerns justified? The current adoption might not be that important as technological advancement sometimes happens in less than no time. Time will tell, but there are some clear forecasts. In blog 2 you will read more about this.